Unlike any of our other spray guns, this is a cleaning gun made completely of stainless steel. One of the greatest advantages of the stainless steel spray gun is its resistance to cold demineralized water. The stainless steel spray gun is able to sterilize, thus the pistols can be used in the operating room or in the clean room. Use this product to effectively clean instruments in a quick and easy way. 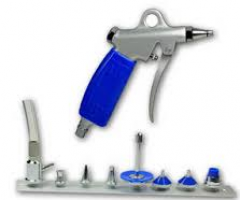 The stainless steel spray gun comes equipped with two nozzles, an inject attachment piece, a trigger locking ring, a wall-mount, a hose with stainless steel snap-closing connector, and a coupling protection cover.